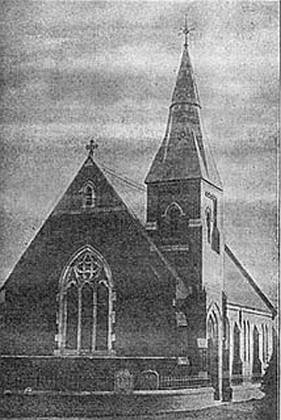 Open air services were begun in Grimpo in 1830, and a chapel was built 1831-2, which opened on Easter Sunday 22nd April 1832. In 1851 the chapel had seating for 200 people. On Census Day 30 March 1851 there were 103 at their morning service and 89 at their evening service, together with 95 Sunday scholars. Due to structural decay the 1832 chapel was pulled down and replaced by a new chapel, built by Mr Griffiths of West Felton to a design by Mr E. B. Smith of Oswestry and built of Ruabon red brick, and stone from Shelvock quarry, The foundation stone was laid by Thomas Barnes of the Quinta on 3rd November 1884, and the chapel opened on 11 May 1885. This is the chapel in the photograph. The chapel is built of red brick and Shelvock freestone, and had a hammerbeam roof and a small tower and spire and seated 200 worshippers. It cost £560. This chapel was still in use in 1962, but was demolished in 1975.